Minecraft is a Game About Placing Blocks and Going on Adventures! Craft, create, and explore alone, or with up to four players in split‐screen and up to eight online. Compete with your friends in Battle, a mini game for Minecraft console editions where you get to challenge up to 8 players online or 4 players in split-screen in a fight for survival, where speed, strategy- and sometimes just pure luck- will make you the winner. 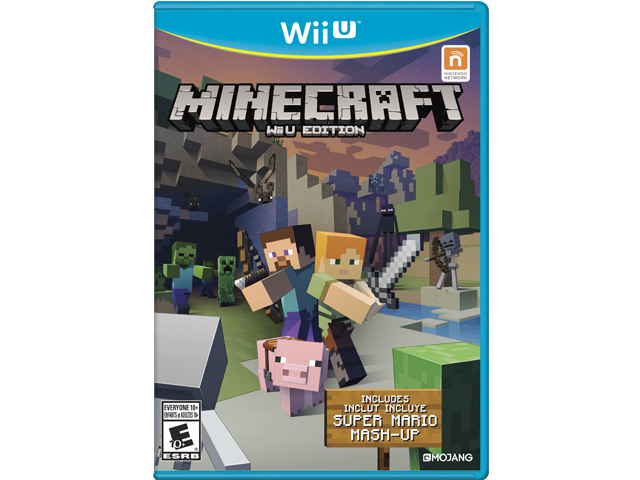 To celebrate Minecraft on Wii U™, this game now comes with the Super Mario™ Mash‐up Pack. Mario and Minecraft, together at last! Super Mario World™ itself! Professional Minecraft builders have remade the likeness of the Mushroom Kingdom and beyond, with Mario‐themed versions of the Overworld, The Nether and The End for you to explore. Super Mario‐style textures, numerous Mario‐themed puzzles, dozens of character skins and music from Super Mario 64™ to enjoy.